In 2016, Nest had the joy of meeting Bib & Tucker Sew-Op on our exploratory trip to Alabama, USA. Through our strategic growth assessments and subsequent collaboration with this phenomenal team of makers, we determined an opportunity to help Bib & Tucker improve its product development strategy through creation of a “manufacturing catalog” that would showcase sample products and techniques to its prospective clients. 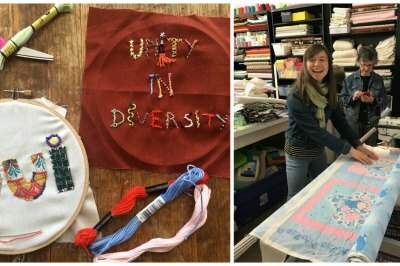 Nest knew just the woman for the job: Nest Professional Fellow, Audrey Ducas, is an avid Nest supporter with a heart of gold and an impressively diverse repertoire of experience that includes sewing and weaving. And so Audrey, a Portland resident by way of Brooklyn, born and raised in France, packed her bags for the ‘Deep South’ to roll up her sleeves for a Nest Fellowship alongside Bib & Tucker Sew-Op. Says Audrey: One of the missions of Lillis Taylor, Bib and Tucker’s co-founder, is to create a nurturing space for people of all ages and background in which to learn new skills, create, play, and grow together. Working with social workers who try to help women from disadvantaged neighborhoods in Birmingham is one of the Sew-Ops greatest goals and endeavors. For example, Heather Wood, a very skilled Sew-Op member is teaching eager sewing novices some basic techniques that can be applied for their own needs (such as hemming pants) or as a vehicle for their creativity to make useful objects (for example making bags). Audrey spent one week collaborating with the Sew-Op’s inspiring women whose joy in learning she cites as palpable and contagious. Audrey assisted in laying out step-by-step production processes and determining opportunities for learning and training to be integrated within that process. Audrey assisted the Sew-Op’s makers in troubleshooting current barriers to smooth production, as well as in prescribing new solutions and systems that will improve production processes moving forward. Audrey’s work with Bib & Tucker builds off a powerful history and important social mission. In 2015, The Sew-Op partnered with UAB’s Department of Art & Art History and the Birmingham Museum of Art to commemorate the 50th anniversary of the Selma to Montgomery marches through open sewing sessions that yielded 461 quilt blocks. Sew-Op members stitched the blocks together and made three quilts which hung at the Selma Public Library and the Alabama Department of Archives in Montgomery during the anniversary. Due to an overwhelmingly positive response, collaborators agreed that this should become an annual project. Each year, a relevant civil or human rights theme is chosen and Bib & Tucker members facilitate open sewing sessions and discussion surrounding this topic. During these sessions, community members create quilt blocks that express personal feelings about the theme. Bib & Tucker members then stitch the blocks into quilts that will be exhibited in tandem with a relevant anniversary or day of recognition. Audrey is proud to add her own personal blocks to this project, and she is not the only one who feels a sense of transformation in doing so. Says Bib & Tucker Co-Founder Lillis Taylor: Audrey quickly became a member of the family during her short stay in Birmingham. The four blocks she contributed to The March Quilts project embody the spirit of this project by drawing people in through transmission of culture and history. This project gives people a safe place in which to discuss differing opinions – and in the end, the members of Bib & Tucker stitch the blocks together just as the project stitches the community together. We all walk away with new stories, new perspectives and a bit more compassion. The synergy that was created during Audrey’s fellowship is helping all of the members of Bib & Tucker Sew-Op work harder towards our goals and we can’t wait to get started!